A love of music seems to be an innate feature of the human race and many children just love practising - I certainly did. However, 595,000,000 results for the search engine enquiry, 'My child won't practise,' suggest that a fair number of children refuse to practise and that their parents are seeking advice but perhaps not coming up with effective solutions. My interest in why children do or don't practise leads me to ask them to tell me about it. I've had many interesting explanations but I'll just recount what Alicia said: 'The piano needs tuning and it sounds so horrible that my mum makes me practise on the kitchen table instead.' In this Music Parent Guide, I discuss how parents can make the conditions in which a child practises pleasant, rather than whether the child actually enjoys playing or singing. Playing an instrument is a bit like taking part in sport - the muscles work best if you are comfortably warm and being cold can lead to injuries, so make sure that the practice area is kept at an acceptable temperature. Extremes of temperature change and humidity are not good for musical instruments either! Before beginning to practise, it is useful and healthy to do a few warm-up exercises, especially if the room is a bit chilly; your child's teacher can advise on something suitable. Being able to play a 'good enough' instrument is so important - battling with a piano that has keys missing is dispiriting and a lovely sound cannot be produced on a reluctant old clarinet that squeaks no matter who plays it. It's understandable not to want to shell out huge amounts of money only to find that your child gives up after a year but an older instrument could possibly be refurbished and a reasonable quality instrument can be a wise investment because your child is less likely to quit and, if he does, you can always sell the instrument. A real music stand is inexpensive and, unlike bending over a table, it will promote good posture . If your child plays the piano, it is important that the stool is adjustable to accommodate physical growth and that, for a young child, there is a foot-rest stool. You know how uncomfortable it is to have to sit for any length of time with your legs dangling above the floor! There is a great footstool called a Solemate that has different height footrests - and it's also a lovely piece of furniture. If finances don't run to buying a Solemate, a stack of books or a plastic kitchen-step stool is adequate. Each instrument has its own requirements for comfort that the teacher will be able to advise on, for instance players of Spanish guitar need to use a guitar footstool to be able to hold the instrument in the correct position. should practice time be sociable or private? A young child can feel very isolated when practising alone, away from the rest of the family. Claire is nearly five and she loves it when her dad sits with her at practice time, because it's a chance to share her growing skills and understanding with him - she revels in being able to do something that he can't do! If Dad is busy, he leaves the door open so that he can listen and make encouraging remarks from time to time. Being pestered by a sister or brother can be irritating, so Claire's little brother is given something else to do while she is practising. Emily's mum is a pianist so they share quality time playing duets together but, for her individual practice time, Emily prefers to be on her own so that she can concentrate better. Practising in private is attractive to an adult musician and, similarly, older children may well prefer solitary practice time - some teenagers (and many adults) dislike being listened to when they practise and, in this case, the best thing is to respect their wish to practise in private. Interruptions can be distracting and annoying. If your child has a friend who plays, practice-buddy time, maybe once a week, could be fun. Taking it in turns to play will enhance listening skills, as well as providing a more sociable experience and it doesn't matter whether the children are playing the same pieces or even the same instrument. They will probably also gain enjoyment and learn a lot from spontaneously making up music together. If your child plays an orchestral instrument, guitar or brass instrument, make it easy for them to pick it up on the spur of the moment by finding a safe space to leave it out, instead of having to get the case from the cupboard, put the instrument together and so on. Buy a proper music stand and leave it set up with the music on it. Such a lot more can be achieved with short, frequent bursts of practice in addition to a regular practice time. Children are increasingly busy with a whole range of activities and parents can often start to think that practice time is 'just another thing' to schedule. A few days off practice now and then will not matter. A whole summer off can be a bit of a set-back in the early stages but children usually come back to learning with renewed enthusiasm after a break. On busy days, just a few minutes of practice is going to mean it's a 'remembering' day instead of a 'forgetting' day. Everyone can fit in five minutes and, if there are some days when your child is reluctant to begin practising, it's surprising how easily five minutes can turn into ten minutes. Make sure your children know that you value music as highly as other subjects they are learning. The psychological, social and wider educational benefits of music are massive (and well-researched), making it just as important as sports and other extra-curricular activities, as long as there is a healthy balance. Some parents even start having lessons themselves and take exams on the same day as their child. If that is a step too far for you, try letting your child teach you to play the tunes she is learning; this is great fun and having to articulate how to do something helps to reinforce concepts and promote deeper understanding. If it's possible, enlist the help of grandparents at practice time - you may have a musical mother or father who would love to offer support and encouragement. Don't call it practice at first! 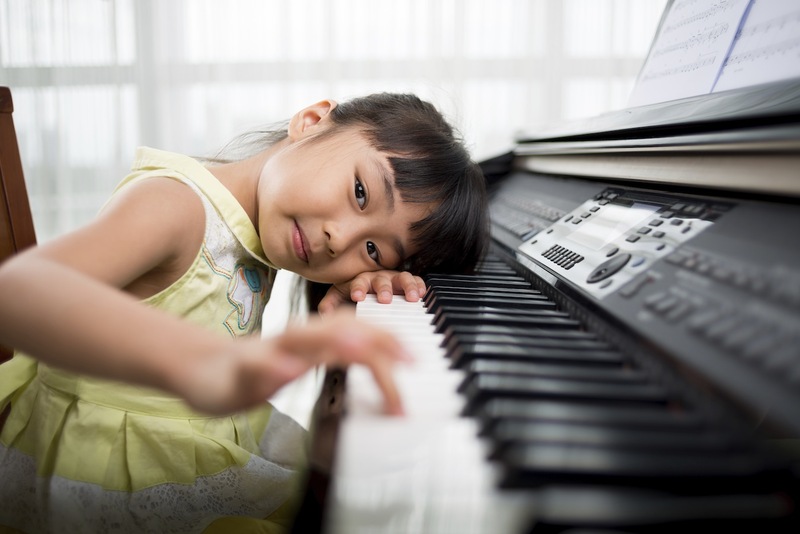 The roots of motivation to practise are complex and, if pure love of music is not enough, then pleasure initially gained from pleasant associations and parental approval can gradually develop into love of music itself, at which point the child may become truly self-motivated to learn and improve. A playful approach to teaching and practising can help to build a love of persevering with music , of devoting time to it and of enjoying the challenge of solving little technical problems as they arise. Word associations are powerful too - how much more tempting and enjoyable it sounds to a little child if, instead of talking about her 'practice', we begin by talking about her 'playing'! Note: The scope of this article was purposely limited to helping parents to consider how they can provide conditions that are conducive to making practice time pleasant. For advice and information on how to practise mindfully and effectively please see earlier blogs in the Music Parent series.